Sure, MLB unveiled this year’s spring training uniforms today and Topps released the first baseball cards of 2017 this week. We can totally talk about those in the comments if you want. 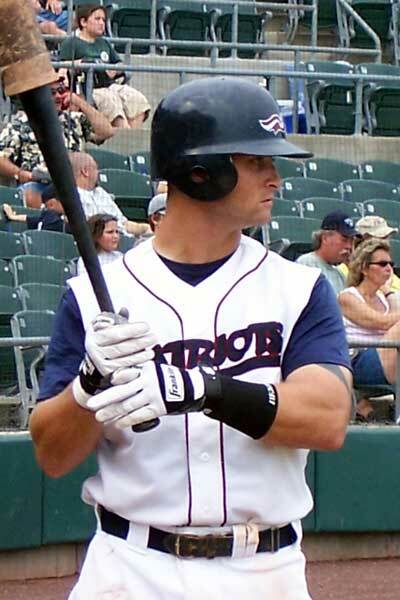 Congratulations to Somerset Patriots slugger Jeff Nettles, who now owns the Atlantic League’s career RBI record. Courier News reporter Ryan Dunleavy noted that Nettles set the record in appropriate fashion – with a clutch 3-run homer to lead the Patriots to a 7-5 win over the Southern Maryland Blue Crabs. I’m sure Nettles never set out to set Atlantic League career records, but 531 RBIs is an impressive total no matter what league you play in. Ben Nicholson-Smith of MLB Trade Rumors takes a look at all of the players age 40 or older who have appeared in a major league game this season. There’s more than I thought there would be, but still frighteningly few. In a few more years, there won’t be any active players left that are older then me. The Mets out-pitched the Yankees to take the first game of the 2011 Subway Series tonight, but Shannon Shark of the Mets Police noted that the luster has faded a bit for what was once the marquee event of the regular season. Tickets for tonight’s game were available for as little as $14 on the secondary market this morning. The Subway Series has lost a little bit of luster as we get ready for the 15th edition to start. Once upon a time, it was a big enough deal that even lapsed baseball fans had to watch. On June 16, 1997, I tuned in the game and saw a journeyman pitcher named Dave Mlicki shut out the Yankees for 9 innings, scattering 9 hits and 2 walks. For one night, the Mets were the best team in New York. The first round of the 2008 edition of the Subway Series is scheduled to begin tonight, weather permitting, with Johan Santana facing Darrell Rasner at Yankee Stadium. The annual meetings between the Mets and Yankees have been one of the few highlights of interleague play, a concept introduced in 1997 by Commissioner Bud Selig. While the series lost a little of its luster after seeing the two teams meet in the World Series in 2000, it has always had its share of magic and memories… Dave Mlicki’s win in the first-ever regular season matchup in 1997… Roger Clemens… Dae-Sung Koo’s improbable double off of an aging Randy Johnson in 2005. This year, though, I can’t help thinking that the magic is gone. The Mets are imploding again, following one of the worst collapses in baseball history last September. The Yankees are in last place. Maybe this weekend’s series will jump start one or both clubs, and there will be some new moments to add to Subway Series lore… or maybe it will just be another weekend of mediocre baseball.